Single Motor synchronizes Conveyor, Star Wheels and Platform Turret and the speed can be varied by VFD. Production Rate : 60 to 150 bottles/ min. 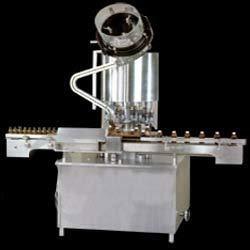 Established in the year 2005, we, “Hardik- Enterprise”, are a reckoned manufacturer and supplier of an unmatched range of Pharmaceutical, Powder Filling, Labeling & Cap Machinery. Under this range, we offer Self Adhesive Labeling Machine, Automatic Injectable Powder Filling Machine, Bottle Cap Filling Machine, Automatic Sealing Machine, Automatic Vial Filling Machine, Automatic Four Heads ROPP Cap Sealing Machine and Dry Syrup Powder Filling Machine, to name a few. The offered range is manufactured utilizing premium grade raw material, which is sourced from dependable vendors of the market. Along with this, the offered range is available in different customized designs such as shapes and allied specifications in accordance with the diverse demands of clients. This range is widely appreciated for its dimensional accuracy, durability, reliability, high efficiency and precisely engineering. Quality personnel hired by us ensure to check the entire range on different characteristics so as to maintain its authenticity throughout the designing process.